Our leather weightlifting belt is made of genuine quality cowhide leather that won t break or wear out over time. If you re serious about lifting, you know a good weightlifting belt can help you draw more power out of your abs and lower back while reducing the risk of painful injury. That s why you should get it right the first time with the Dark Iron Fitness Weightlifting Belt! Comes in 5 sizes - XS: 23 -31 , S: 27"-35" , M: 32 - 40 , L: 36"-44" , XL: 41"-49. Expand your weight training routine with the Harbinger Polypropylene Dip Belt. The contoured design of this belt provides back and upper body support, fitting comfortably during serious training. The 30-inch steel chain and carabiner mechanism allow weight to easily be added for chin-ups and dips helping to develop power and strength in triceps and chest. The Harbinger Polypropylene Dip Belt features thick polypropylene construction with heavy duty steel grommets to secure chain to belt for maximum durability. Adjustable, one size fits all. Dip belt constructed of durable polypropylene with heavy duty steel grommets to secure chain to belt. Contoured belt design provides back support and fits comfortably during serious training. 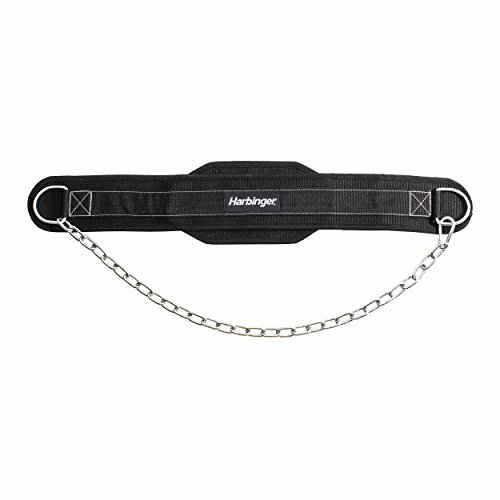 30-inch steel chain and carabiner mechanism to easily add weight for chin-ups and dips. Weighted dip belt helps build power and strength in triceps and chest. The most durable Dip Belt currently available! Do you want to enhance your workouts and weightlifting potential by ensuring proper technique and strength-building? Then our Dip Belt is designed just for you! Whether you're hitting the gym for powerlifting, weight lifting, CrossFit or just some light routines to get you back in shape, it's imperative that you protect your back and thighs with premium-grade Dipping Belt from DMoose Fitness. Our dip belts for weight lifting offer a secure fit for anyone looking to enhance their muscle building routines with proper form and better leverage. Why Our Dipping Belt is Better? 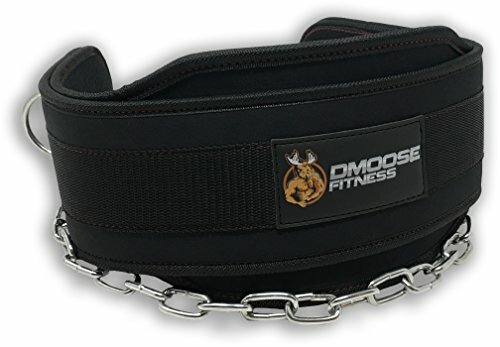 Click 'Add to Cart' now and take your weightlifting and overall fitness seriously by getting a premium DMoose Fitness Dip Belt today. IMPROVED LONG TERM STABILITY - Traditional dipping belts start ripping and breaking down due to weight and use. However, our dipping belt boasts a wide belt design, double stitching, 36 Inch heavy duty steel chain and super heavy duty neoprene material to reduce stress, wear and tear. Our belt, chain & carabiner will not break even at higher weights. 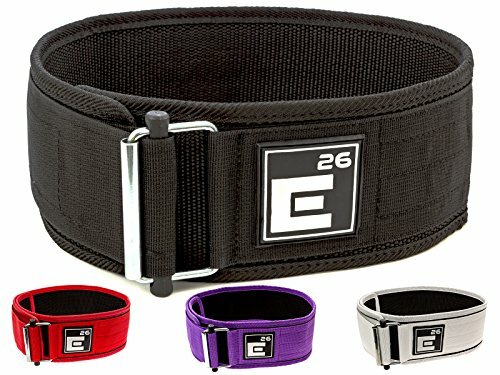 INCREASE STRENGTH & TECHNIQUES - Improve your weightlifting, powerlifting, bodybuilding, pullup and CrossFit techniques with secure, comfort-fit dipping belt. Enjoy bigger gains and sustained workout routines at the gym. Target your Pec major, pec minor, triceps, rhomboids, traps and deltoids muscles. LIFETIME GUARANTEE - Our motto is Give them Quality. That's the best kind of advertising. We want happy & satisfied, that's why we're giving you a full refund or replacement for life to ensure premium craftsmanship although we are always happy to resolve whichever problem occurs. COMFORT FIT - Our Dip Belt boasts a secure, high-grade neoprene and a 36 heavy-duty steel chain to give you premier comfort and stability, while also properly securing weights. Small chain lengths can seriously injure your reproductive organs and pinch new holes in your clothing because they are so close to your body. QUALITY WITH ATTRACTIVE DESIGN - You won't find stylish Dip Belts like these anywhere else! It's a sleek, modern choice of dipping belts for men and women alike! and Relax! These belts are 100% safe, for you and for the environment. Non-toxic, Lead and PVC free to ensure there are no foul smells. RAISE YOUR GAME & POWER YOUR WAY TO SUCCESS WITH PROFITNESS At ProFitness we know how important your training is for your mental and physical health. We also know how important it is to have the right equipment in your Gym Bag when you go for a workout. Not only do our products look good, they offer you everything you need to get your training session completed safely and effectively. When designing & refining all our products, we consult Top Athletes in their field. They not only offer advice, but also extensively test our products to the max, checking for comfort, fit, durability and performance under high intensity, heavy duty workouts. So, we can be sure that our ProFitness 7mm Tapered Weightlifting Belts will continue to surpass all your expectations. IMAGE2 PRE BROKEN-IN FOR INSTANT COMFORT! We know athletes lead busy lives, so we designed our Classic Powerlifting Belts to be used AS SOON as you open the packaging! ALL our belts in the Classic Physic Tapered Series are PRE BROKEN-IN! So, you can take it to the gym Today and use it Today, without needing to take time out of your busy schedule to soften it up first! Our Belts are incredibly comfortable and give the kind of fit you know will support and protect, no matter what. And with added extra suede inner lining on every belt in the series, you will always achieve the ultimate comfortable grip when it matters most. PRE BROKEN-IN LEATHER: At last, a 100% Genuine Leather Weightlifting Belt that can be used Straight Out of the Pack, with No Breaking-In Required. This means you can Start Working-out Straight Away, as if your Brand-New Belt was a Comfortable Old Favourite! Available in 3 colors. OPTIMIZE YOUR LACTIC ACID TRAINING: Our 7mm thick Tapered Powerlifting Belts are Perfect for Bodybuilders, Cross Training, Olympic Lifting & any kind of Fitness Training using Lactic Acid Tolerance. Gain more Muscle Mass & Endurance, do Much More Leg Work, Perform Deeper Squats & Heavy Volume Work. Plus, Lightweight and Durable, so you can 'Feel the Burn' with No Cumbersome Distractions. KEEP GOOD FORM & PREVENT INJURY: The Number One Thought in a Weight Lifters Mind is to Keep Good Form. Our Lifting Belt allows you to do just that. Whenever you lift, you put pressure on your abdominal muscles & back. But with 4 wide back support & 7mm Thick Leather, our Bodybuilding Belt will give you the Core & Lumbar Protection you need, to let you work on your Deadlifts or Pendlay Rows Safely. TOUGH & DURABLE: Made with Top Grain Leather on the outside with Supersoft Suede on the inside, for a Comfortable Fit & Secure Grip. Double Reinforced Stitching with Double Cap Rivets, for Built-to-Last Quality. With Ultra Strong Double Prong Belt to help with More Effective Pressure Distribution. Perform Better than Ever Before! CUSTOMER SERVICE: At ProFitness, we go the Extra Mile for our Customers. We are Very Proud of Our Reputation for High Quality Products & Outstanding Customer Service. If you have Any Issues, we will put them right, Fast! Make a risk-free investment with ProFitness today! What Makes a Great Weightlifting Belt? This is the question we started with when designing the Element 26 Self-Locking Weightlifting belt. We wanted ultimate performance, comfort, and security for CrossFit Athletes. We achieved this by starting with the best material we could find, 100% Premium Nylon. Then, shaped it into the most functional design, a uniform 4" Profile. Finally, ensuring the belt will never come loose during your sets by including the revolutionary Self-Locking Technology. All of these factors created the best weightlifting belt you can buy for CrossFit Athletes. We know you will love this belt and it will last you a long time which is why we back it up with a lifetime manufacturers warranty! Buy Now and know you have the best. BUILT FOR PERFORMANCE: Don't be fooled by cheap knock-off weight lifting belts and copycat lifting belts, only the Original Element 26 Self-Locking Belt is made from 100% Premium Nylon, doesn't have silly padded inserts and mesh coverings which result in unequal distribution of pressure during your lifts and designed by a Doctor of Physical Therapy with only one purpose in mind... ultimate performance for CrossFit athletes. FUNCTIONALLY DESIGNED: One of the most frustrating aspects of other exercise belts is the silly use of contour and tapered designs. A weightlifting belt is designed to create even, consistent, intra-abdominal pressure to increase your stability during your lift, it's not a back support that others claim to be. To do this most effectively, a uniform 4 inch profile has been shown time and time again to be the most effective design by Powerlifters, Olympic lifters, and CrossFit athletes! COMPETITION APPROVED: You know what is the worst? Buying a weightlifitng belt and finding out you can't use it in your competitions. Unlike our competitors, the Element 26 Self-Locking Weightlifitng Belt is fully approved for use in USAW and CrossFit Competitions. Don't be stuck having to buy twice, buy with confidence knowing this belt is approved for your competitions! SELF-LOCKING SECURITY: Unlike other lifting belts that only rely on cheap velcro to support your lifts, our weight lifting belt uses Self-Locking technology that will never wear down and risk injury during your olympic lifts. The self-locking buckle is extremely simple and easy to use, it releases immediately upon pulling the release roller, yet, will never open or slip no matter how big your lift! Quit risking injury and worrying about your belt opening, try the self-locking difference now! LIFETIME WARRANTY: The quickest way to tell if a product is of high quality is to look at the warranty the company provides. Cheaply made products have short or limited warranties because the companies know it won't last a long time. At Element 26, we build only premium quality products and standby them with a lifetime warranty. If you ever have any problem, no worries, we got your back! Hawk Sports Lever Belt Black Genuine Leather Powerlifting Men & Women Power Lifting 10mm Weightlifting Belt! of Power Lifting while designing this belt. Hawk Powerlifting Belt is IPF legal. This lever buckle belt will help embrace your core during heavy lifts such as squats & deadlifts. that helps to stabilize the spine during weight lifting & power lifting. Lever Buckle design makes powerlifting a trouble-free sport. 10mm thickness makes the ideal lever belt for weight lifting & powerlifting. Rounded edges are comfortable to grasp and are skin friendly. Embraces the core to reduce stress on the spine during heavy gym workouts & crossfit. Top level 4-way stitching would hold the hawk lever lifting belt together for years to come. 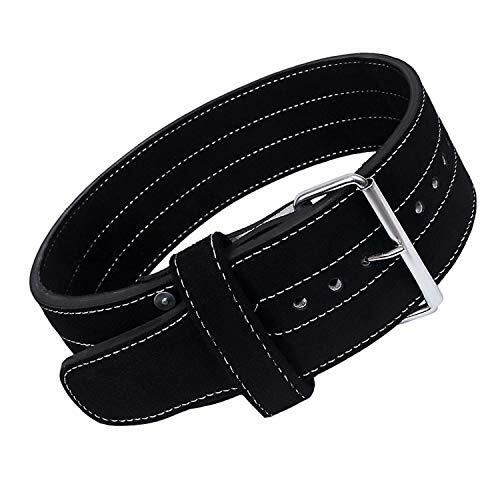 4'' width is ideal to tighten your core during bodybuilding and heavy compound lifts such squats & deadlifts Heavy duty black stitching increases the look and life of the powerlifting lever belt. 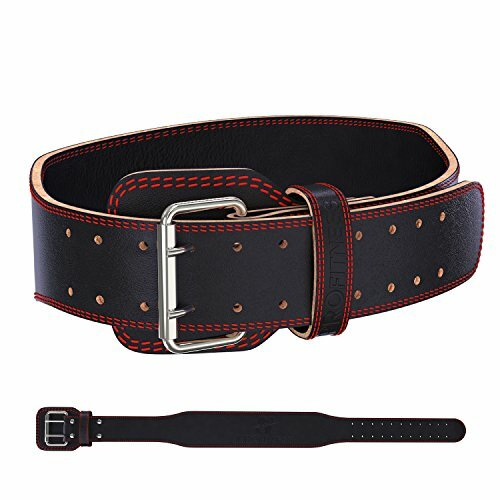 Uniquely, this leather weight lifting belt has 12 holes for waist adjustment. If the lever buckle breaks, please message us, we will send a FREE REPLACEMENT. Genuine suede leather lining for lifetime durability and comfort-ability. This powerlifting belt will serve you for a LIFETIME. Ideal IPF powerlifting belt for men & women. If you are between sizes then please choose the upper size. MAXIMUM QUALITY at a MINIMUM PRICE: This a bargain, we bet that you would not be able to find a lever belt at this price in the market. If the lever buckle breaks, please message us for a FREE REPLACEMENT. BLACK LEVER BUCKLE designed lever belt allows quick and easy use of the lever belt - no fiddling around with the prongs, simply flip it shut straight to your preferred tightness. OPTIMAL FOR POWERLIFTING: This lever buckle belt is Perfect to give added support for heavy lifts that require you to brace core such as squats and deadlifts. GENUINE LEATHER: We provide full guarantee for this weight lifting powerlifting belt lever belt. If you're not satisfied with any aspect of the lever belt, just contact us and we'll be happy to help. Are You Ready to Take Your Performance to The Next Level? We hope you are because we have just the gym accessory for you. 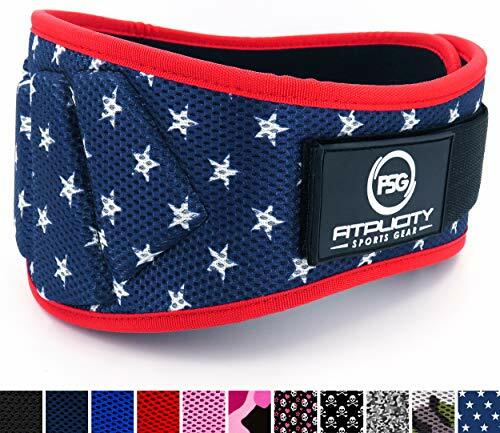 Heavy lifts and personal records demand a certain amount of core control and stability and that's where the Fitplicity weight belt for men and women comes into play. It will brace your abs and lower back, instantly making you more powerful on your most important lifts and it will lessen the possibility of a lower back injury. Most people don't know how important a good weight belt is for injury prevention but that's not the case for you since you are already looking for the best, most durable, made-to-last training belt. Key Features Comfortable Contoured Design for Full Support Fully Adjustable Sizing Heavy Duty Velcro Strap with Smooth Roller Buckle Unisex Design in 11 Different Colors Supports Lower Back/Lumbar/Core 100% Satisfaction or Your Money Back So, what are you still waiting for? Place Your Order Now and Finally Train with Maximum Power and Confidence! PREVENT INJURY: Designed to support your lower back and core, this workout belt provides for better form and stability throughout your lifts. As a result, you will feel more confident and controlled though your movements. INCREASE YOUR LIFTS: Destroy your personal best and increase gains. Our belt allows for extra power, strength and support in your back and abs. Many customers reported better technique while safely increasing their PB by up to 20%. DURABLE & DEPENDABLE: No matter what the WOD is, our gym belt can handle it. Built as tough as your hardest workout, it is ideal for Deadlifts, Clean and Jerks, Squats, Powerlifting, CrossFit and countless other forms of fitness training. ADJUSTABLE & COMFORTABLE: Our lightweight, contoured design gives you the mobility you need to perform a variety of exercises. 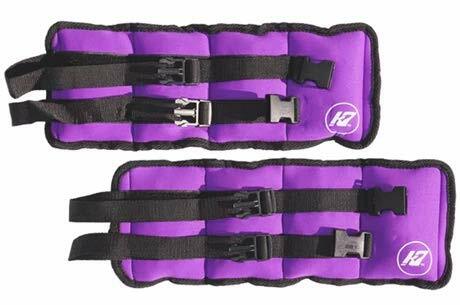 Heavy duty, fully adjustable, Velcro straps allow you to control the tightness as needed, quickly and easily. QUALITY PROMISE: Our neoprene weightlifting belt is made with only premium materials. You can be sure that it will not slip or come apart during your lifts. If for any reason you are not completely satisfied, simply return it for a full refund! 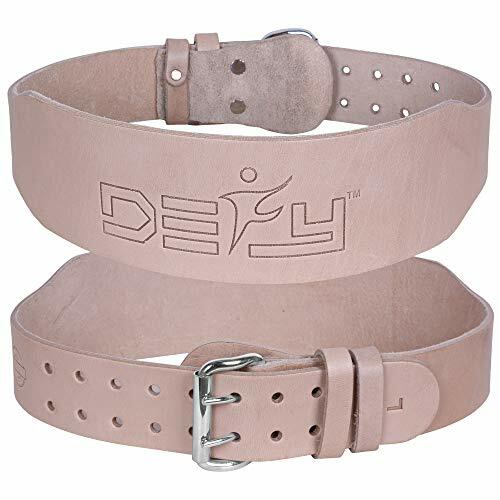 DEFY Leather Belts comes from a team of power lifters and strong men who have considered all the requisite and complications. These Belts are made to IPF specs and give excellent support when lifting. They have been carefully designed to maximize performance, durability, safety, and comfort. The 10mm thickness provides the best support a power belt can offer. It conforms to your body to stabilize support and lets you take your power training to the next level. These power lifting belts will help embrace your core during heavy lifts such as squats and deadlifts. HIGH QUALITY LEATHER: There are genuine layers of leather. It is not layers glued together cheaply to make thickness as some other brands do. This weight lifting power belt is finished with top quality, fine suede providing non-slip surface. COMPETITION & POWERLIFTING STANDARDS: Men or women weightlifters who buy weight lifting, bodybuilding, and powerlifting belts, such as this premium, powerful, stitched performance workout belt, often participate in competitions, and know they can count on our 10mm belts because they're USAPL and IPF compliant. DESIGNED TO LONG LAST: Heavy Duty, Stiff, durable leather for great support; Heavy stitching with black suede lining on inside. 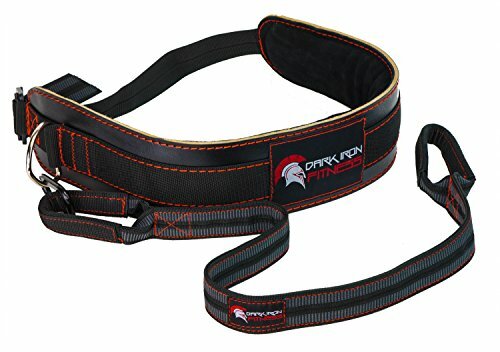 Perfect to give added support for heavy lifts which require you to brace your core during powerlifting with a height of 4 across its length, this belt ensures your back, abs and entire core are evenly stabilized for extra power and strength. HEAVY DUTY SINGLE PRONG: The double roller buckle prongs are precision made, custom zinc plated steel and are unmatched in strength and durability, and it looks great. This belt design allows quick and easy use of the weight lifting belt - Quick ON/OFF. MAXIMUM SUPPORT & COMFORT: Our 10mm thick weight lifting belt conforms to your body shape sooner and is considered by some to be the best and most comfortable thickness for a weight lifting power belt. Kyng Fitness only produces the finest products. You pay for what you get! If you want the best, look no further, Kyng Fitness is the leader in all Fitness Categories. 100% Satisfaction Guaranteed! 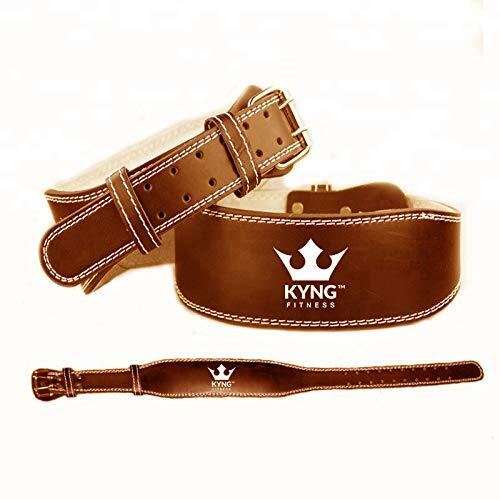 The Kyng Fitness weight belt is 4" wide in the back. It's unique size makes it ideal for everything. 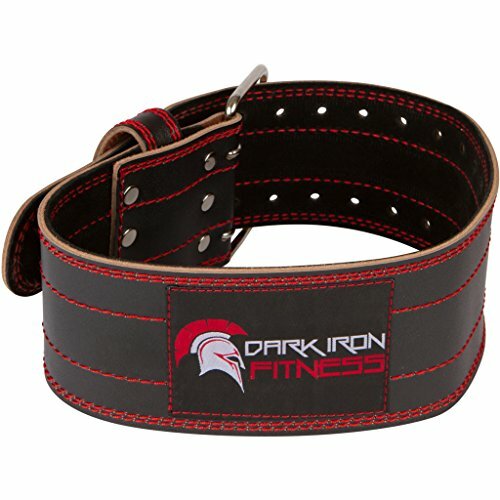 If you're doing heavy dead lifts, squats etc, then this heavy duty leather belt is perfect for you. For workout you need a strong belt for maintaining correct posture and reducing injury. Kyng Fitness weightlifting belt provides you with incredible lumbar and core support during heavy lifting. 100% GUARANTEE: That's right, this item is 100% Guaranteed. We are confident in the craftsmanship of this product and guarantee it! SUPERIOR DESIGN: This belt wont break, or tear. Its contoured design is built for long lasting support. 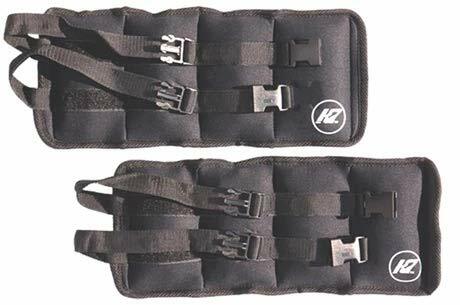 SUPPORT: The buckle and loop support strap gives the ability to adjust tightness for the desired comfort and support needed for leg and core body movements. CONFIDENCE: This belt is designed to support your back while providing you the mobility to perform multiple exercises. Not only can you Body-build using the weightlifting belt, but it is ideal for exercises such as Back Squats, Power Cleans, Deadlifts, Clean and Jerks, Overhead Squats and much more. The KAP7 Water Polo Weight Belt was designed by Olympic Water Polo players to prepare your legs for competition. Soft neoprene fabric allows you to go full contact with the weight belt. The belt comes in two pieces, which allows you to mix and match any of the three sizes of belts (5lb, 7.5lb or 10lb). Can be worn around each ankle to increase range of motion in your egg beater. Can be used for swimming to improve flexibility in the breast stroke kick. Proven training tool used by the top athletes around the world for swimming and water polo. After every use rinse off with fresh water and hang up in cool, dry place to avoid corrosion. 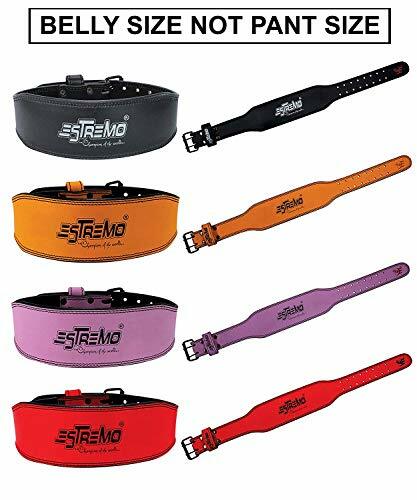 Maximum Strength: Made with genuine leather, ESTREMO weightlifting belt does not break, tear, or wear out like other mass-produced sporting goods made of cheap and fake leather. Soft & Comfortable: interior foam cushioning and suede lining designed to be flexible and soft which eliminates any pain while lifting, yet still maintaining intended consistent support. Prevents Pain & Spinal Injuries: Eases stress on the back and helps in reduce post-workout pain and the potential accidental spinal injuries. Adjustable Size: Heavy duty stainless steel roller buckle design for quick, easy adjustments and a custom fit. LIFETIME WARRANTY: Love them or we'll buy them back. No questions asked!!! 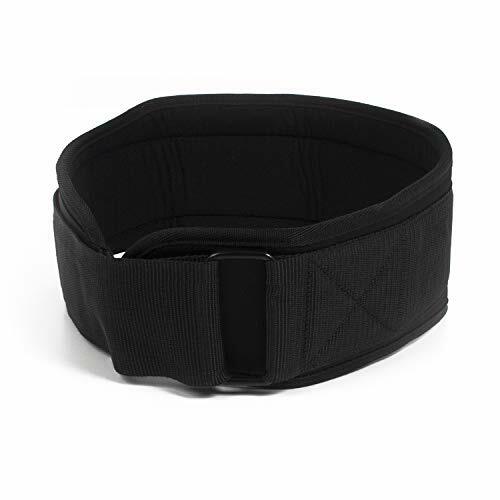 Weightlifting belt for back support in gym and training for fitness. Provides lower back support for men and women. May be used by athletes,construction workers, or warehouse workers who frequently bend and lift heavy boxes. Provides ultimate lower back support for men and women during heavy lifting, squats, and deadlifts. Eases stress on the back Helps reduce post-workout pain and the potential accidental spinal injuries. Made with High Performance Neoprene and Velcro Closure with Professional Grade Stainless Steel Roller Buckle. 5 contoured EVA channels stiffen the 8 inches width maintaining it's shape under pressure and ensures maximum support without bending during squats, bending, and deadlifts. S: 28"-32" M: 32"-36" L: 36"-40" X-L: 40"-44" All sizes are available in multiple colors. Love them or we'll buy them back. No questions asked!!! POWER LIFTING: Our neoprene weighting belt is designed to provide maximum lower back support for lifting heavy weights, squats, deadlifts, or strength training for men and women. Our back support belt fits the natural shape of body to provide ultimate comfort without losing it's functionality. STRONG AND DURABLE: Our Back Support Belt is made with High Performance Neoprene and Velcro Closure with Professional Grade Stainless Steel Roller Buckle. 5 contoured EVA channels stiffen the 8 inches width maintaining it's shape under pressure and ensures maximum support without bending during squats, bending, and deadlifts. LIGHT & COMFORTABLE: With less than 1 Lbs., weight our belt feels super light on the waist and stays firm to body curvature without rolling or bending. 8 inches width curved to fit lower back and to provide ultimate comfort promotes proper posture during lifting or bending. 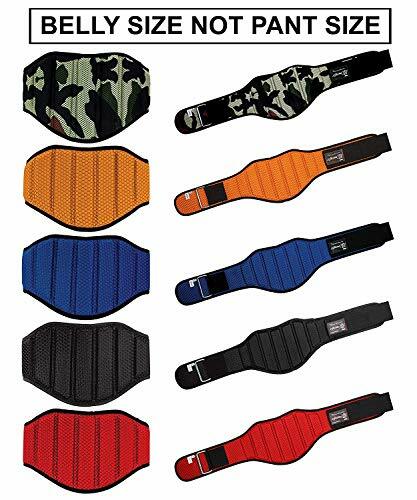 AVAILABLE SIZES & COLORS: Small (28-32 inches), Medium (32-36 inches), Large (36-40 inches), X-Large (40-44 inches); All sizes are adjustable with Velcro closure and are available in Black, Blue, Camouflage, Orange, and Red colors. LIFETIME WARRANTY: Love them or we will buy them back. NO Questions Asked!!! 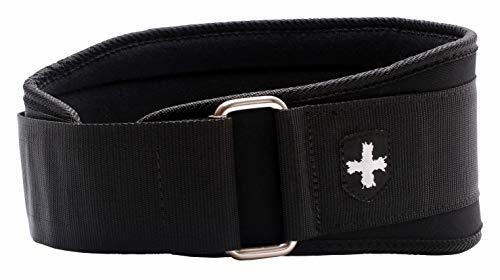 This double prong men's weightlifting belt men comes from a team of power lifters and strong men who have considered all the requisite and complications of weightlifting while designing this belt. hawk weight lifting belt men is an IPF legal bodybuilding belt. These gym lifting belts will help embrace your core during heavy lifts such as squats and deadlifts. A gym workout belt provides a wall for your abs to push against the added force with limited space means increased anterior pressure that helps to stabilize the spine during weight lifting & power lifting. This belt is a SINGLE PIECE OF LEATHER weight lifting belt with NO STITCHING to prevent it from separating of pieces like other belts. Perfect to give added support for heavy powerlifting CrossFit gym weightlifting which requires you to brace your core such as squats and deadlifts. This is an OLD SCHOOL FASHIONED TOP OF THE LINE 4 leather weight training belt gym belt bodybuilding belt. We thrive for excellence and hence our Professional Customer Service ensures your satisfaction. Our product is backed by our manufacturer for complete money back guarantee. DON'T DELAY, BUY TODAY! Synergee's Weightlifting Belt is an indispensable tool that provides support to your abdomen and lower back during lifts.Each belt offers 3" of support in the front and 5" in the back. Cinch it closed with a steel buckle and fasten in place with Velcro. The easy-to-adjust design makes it quick and simple to put on and take off the belt for multi-modality workouts. Available in 3 sizes: S (28-32"), M (30-34"), and L (32-36"). LIFT MORE, LIFT BETTER - Synergee's Weightlifting Belt is an indispensable tool that provides support to your abdomen and lower back during heavy lifts. Evidence from scientific, peer-reviewed studies shows weight belts cue your body to brace yourself for lifting heavy; to breathe in deep and hold it to cushion and stabilize your spine with intra-abdominal pressure. ALL AROUND SUPPORT - Each belt offers 3 of support in the front and 5 in the back. Offers support and flexibility for dynamic, multi-faceted workouts. The Velcro fastening makes it fast and easy to take on and off before, throughout, and after multi-modality workouts. SUITS ALL YOUR NEEDS - The Nylon material and inner padding provides the right amount of support, while remaining malleable enough to fold or roll-up into your gym bag. This design offers a greater range of motion than leather belts. It is perfect for athletes that train using dynamic movements: power and Olympic lifting, kettlebell and dumbbell work, and more.